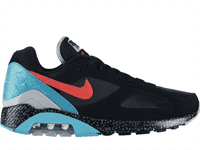 The Nike “Air Max 180” debuted in the same year that featured the Huarache and Air Max BW. While the color of the original laces will depend on the pack / colorway / release, the OG shoelace style and sizing is the same across all. 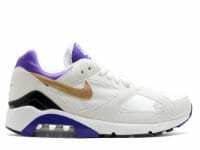 The Air Max 180 come equipped with standard, flat bodied cotton / poly blend laces, generally between 52 and 54 inches (137 CM). If you prefer to wear your laces untied, we recommend going with a slightly shorter, 50 inch shoelace – it’s a better fit for laid back styles. 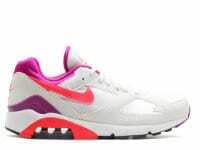 Released in 1991, the same year that debuted the iconic Huarache and Air Max BW, the Nike Air Max 180 rounded out what was considered an all-time great year for sneaker debuts. Bruce Kilgore and Tinker Hatfield teamed up to deliver this design. The 180 moniker was was derived directly from the 180-degree visibility of the transparent unit. In addition its 180-degree mid and outsoles, it also featured 50 percent more air in the cushioning. 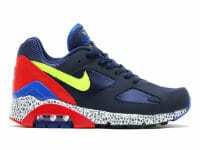 Many considered the Air Max 180 to be the little brother to the Huarache and Air Max BW because of how overlooked it was when compared to the two. However, 20 plus years later, the Nike Air Max 180 is starting to finally get the shine and attention it richly deserves. Is this for ALL Am 180s? Or just a few colorways…?